The last of her family’s Greatest Generation, Frances “Fran” Rome Glimes, age 97, of Victoria, KS, passed away on Sunday, March 18, 2018 at the Hays Medical Center. She was born in St. Peter, KS to Michael and Katherine Rome. 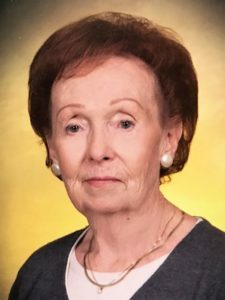 Fran was a member of the St. Fidelis Parish, Daughters of Isabella, VFW Ladies Auxiliary. In 2008, she was an awarded Donor of the Year for hospitalized veterans. She came of age in the Dust Bowl and the Depression. As did many of her age, Fran moved to a big city seeking opportunity. She started as a housekeeper on the Gold Coast of Chicago. When the US sent most able-bodied men abroad to fight in WWII, she became a worker on a B-52 flight line. She is survived by her daughter, Diane Glimes of Russell; six grandchildren, James Rosenberg, (husband, Santiago Gonzalez), Michael Rosenberg; John Cole and his wife Sheryl, Roschelle Lane, Sherry Lynn Alvarez and her husband Chris; Charles Glimes and his wife Foteni; four great-grandchildren, Stephani and Mandy Kinzie, Sheri Cole and Ashley Forde; five great-great-grandchildren, Alison and Michael Fiehler, Nicholas Glimes, Sharmaigne and Abel Kinzie; daughter-in-law, Mary Ann Glimes as well as a loving extended family. Fran is preceded in death by her parents; beloved husband, Charles E. Glimes; daughter, Sharon Glimes; son, Michael Glimes; granddaughter, Rondasue Nehlson. A graveside service will be held at 2:30 PM on Saturday, March 24, 2018 at the St. Fidelis Cemetery, Victoria, KS. Visitation will be 12:00 PM – 2:00 PM, Saturday, with a parish vigil service at 1:30 PM. followed by a VFW Ladies Auxiliary memorial service followed by a joint rosary with the VFW Ladies Auxiliary and Daughters of Isabella all at the Brock’s-Keithley Funeral Chapel & Crematory, 2509 Vine St., Hays, KS 67601. Memorial contributions can be made in Fran’s memory to St. Jude Children’s Research Hospital, 262 Danny Thomas Place, Memphis, TN 38105.